Today’s post is brought to you by guest blogger Charles Baldner, who will be writing a few blog posts this summer on topics related to stellar structure, asteroseismology, and stelalr activity. Charles is a graduate student in the Astronomy Department at Yale University. In his research, he uses helioseismology to study links between the interior of the Sun and solar activity. Kepler is, first and foremost, an instrument designed to discover and investigate planets around other stars. It will probably not surprise you, however, if I tell you that Kepler data also provides an astounding amount of information about the stars themselves. What the planet hunter sees as noise – that annoying scatter in the data that hides or confuses the telltale signs of a planet – is music to another scientist. I mean that almost literally: like drums, flutes, bagpipes, or guitar strings, stars ‘ring’ at a variety of specific pitches, encoding information about all sorts of stellar properties. Using these `sounds’ to study stars is the science called asteroseismology. A star is, more or less, a giant sphere of hot gas. Just like in the Earth’s atmosphere or oceans, waves can propagate through a star’s interior. These waves can reflect at the surface, causing it to move up and down, or to brighten or dim. If you can measure the velocity of the surface of a star very precisely, or measure the changes in brightness at the surface, you can detect these waves. If you take enough measurements, you can perhaps see the star ringing just like a musical instrument. In many stars, in fact, the waves you are seeing are sound waves, bouncing back and forth in the stellar interior just as they do inside an organ pipe. We have used this kind of study to probe the inside of the Sun for more than thirty years. This is called helioseismology, and we have used it to determine the structure of the Sun very precisely. 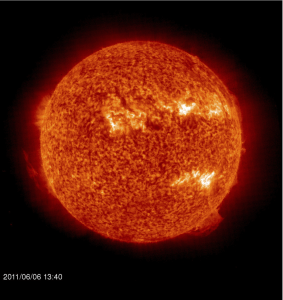 We can measure to great accuracy, for example, exactly where the interior of the Sun changes from `radiative’ to `convective’ (to learn more about the structure of the Sun, you can of course start at Wikipedia: http://en.wikipedia.org/wiki/Sun). We can also see the effects of rotation — different layers and different latitudes of the Sun rotate at different speeds, and we can measure this with helioseismology. Today, I use the tools of helioseismology to probe the regions just beneath sunspots. asteroseismology to study large numbers of stars. In a future post, I’ll go over a few of the sorts of things we hope to glean from Kepler’s asteroseismic measurements.